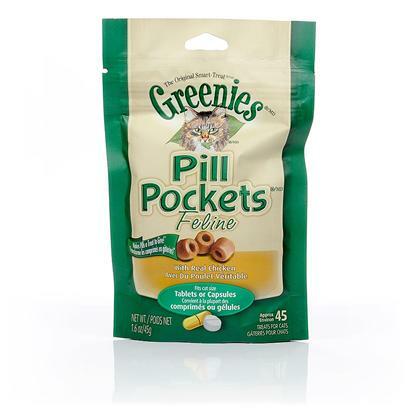 Pill Pockets for Cats is a simple, healthy way to administer oral medications to your cat. Containing vitamins C, E, and other nutrients, Pill Pockets for Cats will not only save time, but also benefit your cat's long term health. Options Available: 1.6 oz Salmon 45pcs. 1.6 oz Chicken 45pcs. Rated 3.5 out of 5 by 133 reviewers. Great Way to Get Medicine to your Cat!